Eat Your City: Apple cinnamon cranberry flax chia seed muffins with oatmeal pecan streusel recipe - tasty lowfat and high fibre! 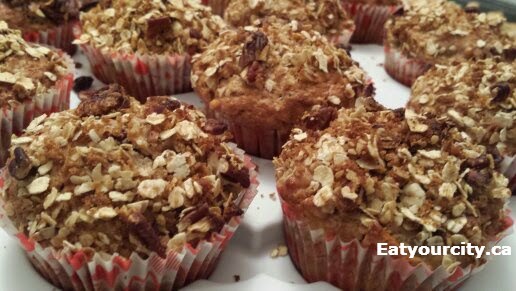 Apple cinnamon cranberry flax chia seed muffins with oatmeal pecan streusel recipe - tasty lowfat and high fibre! Posted by I love apples.. especially when you pair them up with the memory making and smile inducing flavors of brown sugar, cinnamon and nutmeg. There's something magical about that combination. So when I had a lot of leftover sliced apples from a baby shower (I had made a bunch of apple and brie sandwiches), I whipped up a batch of apple streusel muffins... I haven't made these in years for some reason, and though the recipe is already high in fibre, I updated it and hid a tinny bit more healthiness into it by adding in ground up flax seeds and chia seeds that added a wonderful nuttiness to the muffins (and the healthy-fibre-ness was totally disguised by the apple cinnamon flavors!) So here's a tasty apple strusel muffin that hides its low fat, high fibre side with tastiness and help you start off the new year right! And yup... this recipe is actually low fat, but its difficult to tell as the apples and sour creme (or yogurt if using) adds in so much moistness to the muffin, you don't even miss the butter... so a muffin that's low fat, high fibre, with a decent whack of protein AND tastes like apple pie? Yes.. its for real! And perfect for snacks, breakfast or entertaining with zero guilt :D Oooooooh indeed! If nuts are an issue, you can always take them out.. they add a nice crunchy element and ties in really nicely with the nuttiness of the flax and chia seeds... the craisins can be subbed out with raisins or any dried fruit or omitted if you really dislike them... I like craisins as it adds in a touch of tartness and an extra bit of fibre to boot. You can use any type of apples.. I used some Gala and Honey Crisp apples as I had them on hand. And do use a apple peeling gadget.. sooo much faster and easy clean up when it comes to peeling lots of apples! This recipe makes 12 regular sized muffins, and you can easily doule, triple etc! 3) In a large mixing bowl, sift the flour, baking powder, baking soda, flax seeds, chia seeds and craisins together, then form a well in the center. In a small mixing bowl, whisk together the melted butter, eggs, rest of the brown sugar (1/6 cup), milk, sour cream and vanilla. Dump the wet ingredient mixture into the flour mixture and mix well, then mix in the seasoned apples. The batter will be pretty thick. 4) Fill the lined muffin tin about 3/4 of the way up. In a small bowl, combine all the struesel ingredients together, then scoop a heaping teaspoon of the streusel mix onto the top of the batter in the filled muffin tin. 5) Bake for 20-25 minutes, until a toothpick comes out clean when you give it a poke (watch the nuts - if they're gettnig too toasty, cover with tin foil). Take out of the oven and let them set in the muffin tin for 5minutes, remove to a cooling rack to cool and nosh on!